Four Bulgarian parties will certainly make their way to Bulgaria's 42nd General Assembly, according to an exit poll of the Institute for Social Studies and Marketing, MBMD. The voter turnout, according to the poll, was 55% (3.8 million people) by 8 pm, when voting sections closed officially. The center-right GERB party of former Bulgarian Prime Minister, Boyko Borisov, won by a 5.2% margin most votes in Bulgaria's general elections, tallying 31.4 % against the Socialists on 26.2%, according to MBMD. In addition to GERB and the Bulgarian Socialist Party, BSP, the others are - the ethnic Turkish party Movement for Rights and Freedoms, DPS, with 11.5% and their self-proclaimed arch enemies the far-right nationalist Ataka (Attack) – 8.2%. Stunningly for many none of the oldest "hardline" right-wing formations are going to be in the next Parliament. 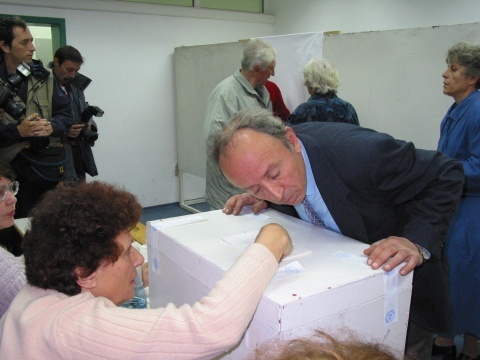 From the right-wing parties, which are credited with throwing out the ex-communists who had pushed the country to the brink of financial crisis in the 90s, only Democrats for Strong Bulgaria, DSB, of former Prime Minister Ivan Kostov is close, garnering 3.7 % of the vote. The right-wing Bulgaria for Citizens of former EU Commissioner, Meglena Kuneva is also close to the 4% threshold with 3.1%. According to this poll, GERB party won about 98 seats; the Socialist Party will capture as many as 81 MPs in Bulgaria's 240-seat unicameral parliament. Another 36 seats are expected to go to the ethnic Turkish Movement for Rights and Freedoms, DPS. The nationalist Ataka party ranked fourth, capitalizing on anger at corruption and poor living standards and has tapped on ethnic debate. It is expected to secure 25 MP seats. Despite purported landslide victory, the marginal conservative Order, Law and Justice has only 1.9%. The nationalist National Front for Saving Bulgaria has 2.9%, the other nationalist VMRO – 1.9%; the Center - Freedom and Dignity, which is a coalition between the party of former Tsar and Prime Minister, Simeon Saxe-Coburg and of ethnic Turkish politicians (Kasim Dal) who left DPS has 1.8%, the right-wing Union of Democratic Forces, UDF – 1.8%, the Greens – 0.9%, and the Coalition Gorda Bulgaria (Proud Bulgaria) of MEP, Slavi Binev – 0.4%, among the total of 38 parties and 7 coalitions, which joined the race. » High Time to Get Down to Work! » More of the Same? Are Bulgarians Insane? » MP Wannabes - Who? Where?